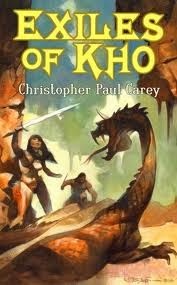 EXILES OF KHO by Christopher Paul Carey is now an e-book! Hundreds of years before the hero Hadon sailed forth from his shining city of gold and jewels upon his legendary adventures, the heroine-priestess Lupoeth set out upon the decree of the oracle to discover a new land upon the untamed shores of ancient Africa’s southern sea. But Lupoeth finds herself little prepared for the trials ahead, as well as those that follow upon her heels—for the jealous queen who wants her rival banished has appointed a worshiper of the sun god with a criminal past as the expedition’s priest, hoping to undermine the mission and seal its doom.